Before commencing our class, we had to watch a TED talk by David Eagleman called Can we create new senses for humans?. The talk was very intriguing and interesting and gave me some very good ideas about augmented sensing. One example in particular that I was intrigued by, was how one Eagleman’s research experiments, allowed a deaf person to regain the ability to hear after a dozen of vibration motors where placed behind his back. Every vibration motor would react to a specific sound frequency that would be picked up by a microphone. The vibration motors would then output a corresponding vibration relative to the intensity of a specific sound range. And this allowed the subject’s brain to adapt to this sense and allowed him regain his hearing abilities without using his biologic ear at all! This intriguing experiment led me to ordering a dozen of these vibration motors an start to see what can I do with them. It also made me realize how adaptive our brain is, to a point where it is possible to substitute or augment a sense with something completely different. One of the members of our Radiation team brought in a very interesting artifact that caught the attention of our whole group. It was a diffraction sheet which is made like any other plastic sheet, except that it reflects light in a very particular way. This is because the sheet features hundreds of microscopic indented lines per millimeter. This in turn, causes the sheet to have very particular deflection abilities which can be used for “dissecting” the visual spectrum. Different types of gratings on sheets which gives them various diffracting capabilities. A lightbulb when viewed from through one of these sheets. According to Wikipedia, Diffraction grating “is an optical component with a periodic structure, which splits and diffracts light into several beams traveling in different directions”.1 This technique is often used on CCD sensors which can be found on mobile phones and cameras. 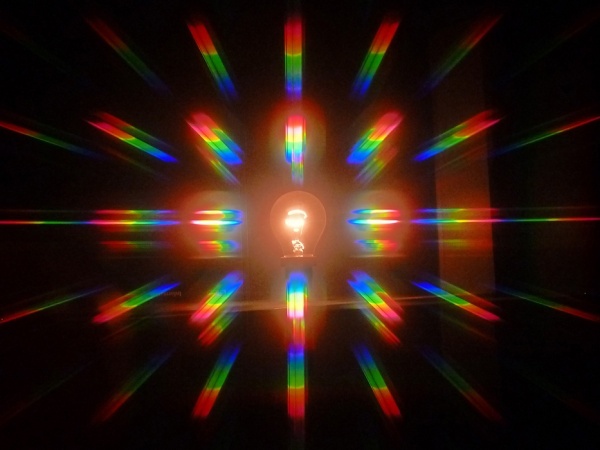 diffraction grating is used to filter out Infrared and Ultraviolet radiation and leaves out the electromagnetic spectrum that can be sensed by the human eye (wavelengths from 390 to 700 nm2). With our group we also talked about the very interesting aspect behind they cybernetic senses are able to form memories of its subjects. The Interview that we had with Liviu Babitz on Week 2, pinpointed how his North Sense allowed him to gain a more sensuous grasp about the various geographical locations that he visited. This allowed him to form memories about particular places that where not just based on his natural senses, but also on the “memory imprints” that the cybernetic sense made in his brain. Cybernetic Sense as an Augmentation of the Brain’s Deepest Functions. Thus, even if a cybernetic sense might not be seen as a sensuous augmentation, more attention can be dedicated to studying how cybernetic senses form memories in their subjects. Perhaps sense augmentation can be seen as something intriguing but it might be a very superficial way of looking at the potential of cybernetic sense augmentation. New explorations and studies have yet to be made that study how cybernetic senses interact with the deepest functions of the brain such as memory, emotion. This is where the potential of cybernetic sensing lies.